Budgeting – The Pixar Way! When you’re collecting miles & points for your next big trip, you’ll want to put many of your everyday expenses onto the best rewards credit card for your travel goals. But at the same time you don’t want to spend more than you normally would just to earn credit card rewards. And you’ll definitely want to avoid late fees and interest by paying your bills on time and in full each and every month! If you’re looking for a fun, quick, and easy way to manage your finances, I’ll share with you a simple method I’ve borrowed from the creative wizards that run Pixar. Popsicle Sticks on a Velcro Board Is a Simple Way to Bring a Little Pixar Magic to Your Budget! For some folks “credit cards” is a curse word because they’ve seen them do a lot of financial damage to friends and family. And studies seem to show that you’re more likely to overspend if you’re using a credit card instead of cash. But I don’t think credit cards are inherently good or bad. They are a tool – like a hammer – that can be used to build or break. And if you’ve hurt yourself with a hammer before it doesn’t make you a bad person or mean that you’re incapable of ever using hammer. You just need a little practice and a bit of instruction from an experienced builder. And as much as possible, I try to learn from the experts rather than make the same mistakes myself. Having a budget and sticking to it is an essential tool for making credit cards work for you and not against you. I’ve got an excel spreadsheet sto keep track of my monthly expenses. But to be honest, it takes time to update. So most of the month I’m just guessing how much I’ve spent. Usually, I’ll only see the damages at end of the month once I finally sit down and add up all my purchases. What I needed was a simple and quick way to monitor what I’m spending day to day. And I found the answer in a book about the animation giant Pixar. The Magic of Pixar Comes From…Popsicle Sticks? I recently finished Creativity Inc. by Ed Catmull, who has been the president of Pixar since its beginning. It’s a great read if you have any interest in how such a large company can maintain such a high level of quality and creativity over decades. But what stood out to me was how they budgeted their time on a project. Pixar measures how much time it takes to make a movie in person weeks, which is how much work one person can get done in a week. To help the directors budget their time they developed a system using Popsicle sticks (with Velcro attached to the back) and Velcro strips. Each Popsicle stick represents 1 person week. And each task has it’s own Velcro strip. So when something needs to be added to a movie, Popsicle sticks are moved from one Velcro strip to another. It’s easy for the directors to see which scenes are taking the most time to create because those will have the most Popsicle sticks. And it helps everyone understand that if they want to add something they’ll need to take Popsicle sticks from something else. I’ve only recently started using the Popsicle sticks and Velcro method for my budget, but I already like it because it’s visual and tactile. When you’re budgeting something like time or money it’s easy to spend now only to feel the pain later because it’s out of sight and out of mind. But this budget is next to my bed. So I’m reminded of it twice a day. I’ve setup a simplified version where I subtract my reoccurring bills (rent, insurance, phone, etc.) from my income and then put the number of Popsicle sticks equal to the money that’s leftover on the top Velcro strip. 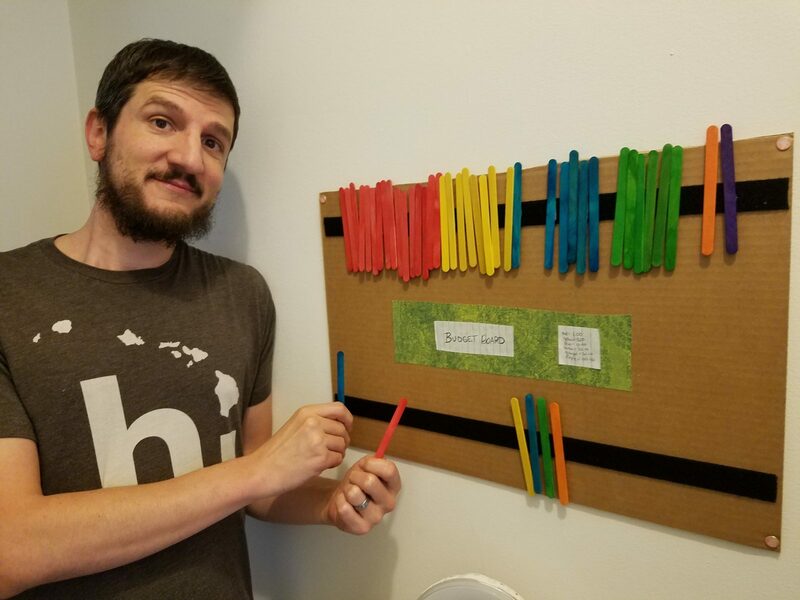 I have colored Popsicle sticks and each color represents a different dollar value. At the end of each day, I simply move the Popsicle sticks I’ve spent from the top to the bottom. I think this could be a good way to teach budgeting to kids because it’s so simple and fun. And most adults I know need more fun in their lives too! How do you manage your budget? What has worked and not worked for you? I’d love to hear about it in the comments.